I'm having trouble watching my workouts. Can you help me troubleshoot? 1. Check to see if there are any updates available on your browsers and update if you can. 3. 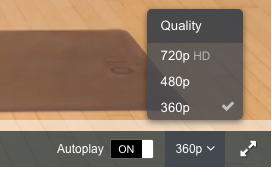 Change the resolution of your video to 360p: the lower the resolution, the less connection speed required to smoothly view your workouts! You can find this option in the bottom right corner of all of our videos. 4. If available, update your flash player. 5. If available, update your computer's software. 6. Try switching devices from your computer to your mobile device, or vice-versa. Know that the best way to watch your workouts on your mobile devices are through our free app, not an internet browser app. You can download our app from your device's app store.